For one single, sacred day during the 2010 section of Intern Year, the forces of Light and Darkness align. Lost in a strange land, immersed in a two-week stint of Foreign Service, Dr. Grasshopper experiences an overwhelming wave of culture shock! …..and Actually Manage To Write Something for the blogosphere tomorrow? Tune in next time, dear denizens of the Interwebzes, for……. DR. GRASSHOPPER Vs. A SECOND DAY OFF!!!! Coming soon, to an Imaginary Friends Blog Near You! 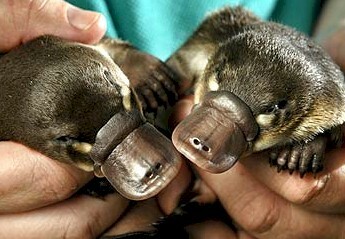 Perhaps a picture of TWO platypi?